The World Travel Awards™ is the most prestigious, comprehensive and sought after awards programme in the global travel and tourism industry. To be voted a World Travel Award™ winner is an accolade which many strive for but few achieve. 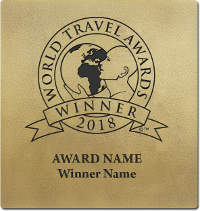 We offer World Travel Awards™ (WTA) Winners the following products and services to promote the accolade and showcase their product to generate exposure and revenue. 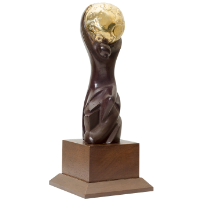 Highly coveted World Travel Awards™ trophy, sought after for displays at Hotel Receptions, Executive Offices, Trophy cabinets and other public areas. To order your Winner Trophy, please email [email protected]. The World Travel Awards™ Winner Wall Plaque is perfect for display outside premises, in hotel lobbies, receptions, sales counters in fact anywhere you want the public to see that you have been voted the best of the best within World Travel Awards, the most comprehensive and recognised travel awards programme in the world. The wall plaque is produced from a base of 30 pound High Density Urethane (HDU) which is then coated with a cold applied, real metal coating. This patented LuminOre® Metalizing Process is up to seventy-five percent real metal and is in use worldwide as an architectural and industrial coating. LuminOre® is well established, reliable and extremely durable. After application, it has all the properties of cast or sheet metal but without the limitations. 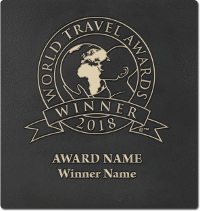 To order your Winner Wall Plaque, contact your World Travel Awards contact or email [email protected]. For more info, download the information sheet. Keyhole mounting brackets are pre-installed and suitable screws are supplied that are appropriate for most installations. The Winner Wall Plaque is made to order. Delivery can be expected approximately six weeks from receipt of payment. As an official Winner, you are encouraged to use the World Travel Awards™ Winner Shield© in all corporate publicity and for media purposes. The Winner Shield is used by many of the world's leading travel & tourism companies in their global advertising & marketing campaigns. The digital Winner Package includes the World Travel Awards™ Winner Shield© in various formats and a digital copy of your World Travel Awards™ Winner Certificate. To order your Winner Package, please email [email protected].